This is a reliable, basic cake donut batter meant for a 30 count bite-size donut pan. 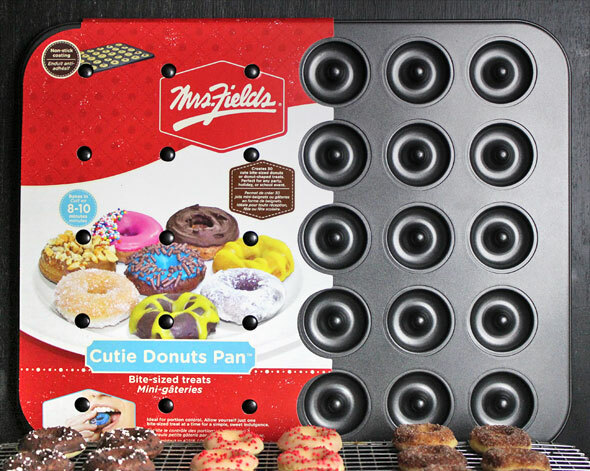 The pan I use is called a Cutie Donut Pan made by Mrs. Fields. The mini donuts are a little less than 2-inches in diameter - roughly the size of a 50 cent piece. This same batter can be used for larger baked donuts, but the cooking time will increase a few minutes when the size of the donuts increase. Beneath the basic donut recipe, you'll find some small-batch icing recipes for topping the donuts. Preheat oven to 325 degrees. Grease each cavity of the donut pan, preferably with butter. In a large bowl, mix together the flour, baking powder and nutmeg. In a medium bowl, cream together the softened butter and sugar until fluffy. A hand mixer works best. Add the egg, milk and vanilla extract and beat just until well combined. Add the butter and sugar mixture to the dry ingredients and mix with a spatula, just until all of the flour has been moistened. Try not to over-mix. Fill each donut cavity about 3/4 full. A little more or a little less is fine - just so long as the cavities aren't filled to overflowing. I use a pasty bag with a large tip, but you can just as easily fill a large zip-lock bag and snip a corner to make a pastry bag. Bake for 8 to 10 minutes. Test at 8 minutes by inserting a toothpick into the thickest donut. If the toothpick comes out clean (no batter), then they're done. 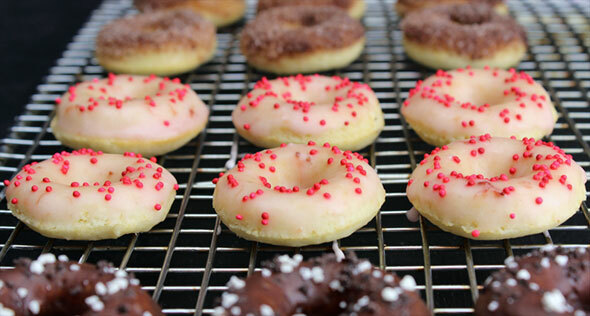 Allow donuts to cool before icing or adding toppings. These are very small batches of toppings. 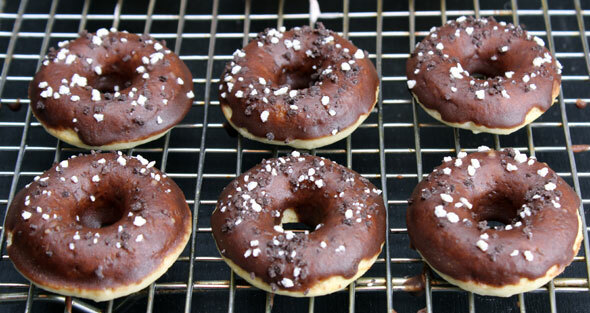 Each one is meant to top about mini-donuts, so that you can create a variety of beautiful little donuts. Melt the butter in the microwave in a small microwave-safe bowl (about 15 seconds). Add all remaining ingredients and stir until well combined. Microwave on high for 30 seconds (icing will bubble). Stir and microwave 20 seconds more. Stir one last time. Wait about 1 minute and then dip the tops of each donut in warm icing. If you want to add sprinkles, do it right away while the icing is still warm. Let donuts set for 20 minutes or so for the icing to firm up. Place all ingredients in a bowl and stir until the consistency is like honey. Add additional water a couple drops at a time if icing is too thick. Dip tops of mini donuts in icing. Let them set for at least 10 minutes for the icing to firm up. Melt the butter in a small bowl or ramekin. Mix together the cinnamon and sugar in a small bowl. Take a donut and dip the top and sides in butter. Then, dip the top and sides in the cinnamon sugar. Repeat for 9 or 10 more donuts. Place powdered sugar in a shallow bowl. Toss donut in powdered sugar until coated. Repeat. Easy, basic (ie. basically delicious) mini donut recipe with 4 small batch topping recipes: chocolate, berry and cinnamon/sugar. Mr Breakfast would like to thank MrBreakfast for this recipe. Recipe number 3282. Submitted 9/14/2016.